In 2004, the federal government passed the Individuals with Disabilities Act (IDEA). This act requires school districts to provide a free education that meets the needs of all children, including those with physical, intellectual, and/or emotional disabilities. When those disabilities threaten the child’s ability to learn, school districts are required to offer free special education (SPED) services. SPED is not a one-size-fits-all classification. Some children need SPED services because their brains don’t function as quickly or efficiently as their peers’. Others have normal intelligence but struggle with physical, emotional, or specific cognitive deficits. 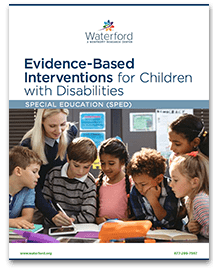 While some disabilities require specific interventions, it’s also true that a handful of evidence-based interventions help nearly all children with disabilities. Your download should start immediately. Want to speak with someone now? Call us at 877-299-7997. Waterford.org is a 501(c)(3) organization, and gifts are tax deductible as allowed by law.